…but when you log onto this blog in a week’s time things will look rather different. I am combining Extremely Pale Rose with the new website for my magazine www.blueskylivingmag.com. I will continue to write the same weekly blog but there will also be loads of additional content. In the meantime some thoughts on how to sell advertising because after 6 months of hard work setting up the magazine I have finally turned a profit of….drum roll…..300 euros. Somehow despite earning in a week only slightly more than the minimum hourly wage I am flushed with success. Imagine also the delight of our one misguided friend who lives in LA who put some cash in to the venture. I am going to be sending her a whopping great dividend that will pay for the coat check (maybe only partially) at some swish Rodeo drive eatery. I’ll also tell her its all about the future because nearly all new publications lose money for the first couple of editions, so in fact BSL has already joined the elite of the magazine world. And so if you too want to make 300 euros in 6 months, here’s how it is done. 1. Be different. In my case that wasn’t hard. I’ve yet to meet another English travelling salesman in Provence. 2. Take a baby with you. The subtext being take an advert in the magazine or he/she will starve. 3. Tell the truth - this is a variant of (1) since honesty is not an attribute usually associated with salespeople. In fact my pitch sounded more like a health warning… an ad in Blue Sky Living may or may not attract business, and advertisers should take proper financial advice before committing…. 4. Tell the truth - but make sure that your French is so bad that people don’t understand you. 5. It’s a numbers game - someone has to say yes eventually. Well we finally gave in. We put aside our worries about the termites eating the walls and signed the compromis for our new house. As I write this I only have 2 days left to pull out of the transaction, after that we are legally obliged to buy. Once the foundations are down, there’s a rush to build the exterior before the end of the year. Hopefully, by January when the bad weather moves in all the workmen will be snug inside doing the electrics etc…Giving us a couple of months to finish everything off before the projected move in date of April. As I said that’s the plan. People who know the area and the propensities of the local builders well, give us absolutely no chance of achieving our schedule. Their best guess is that it will be ready in two years time. The only problem is there’s no contingency in the budget for this. Naïve me - never. Apologies to regular readers who have logged on for an update in the last week, but I have been working in rather un-provencal fashion - up at 6.30am, a black coffee fuelled morning, and a red-bull charged afternoon, by the time I slumped into bed my whole body was shaking from the caffeine and the list of things to do the next day that was rumbling through my head. It all reminded me of being a London lawyer. And the reason for all this angst? Well as of this morning, the first edition of Blue Sky Living was officially finished. 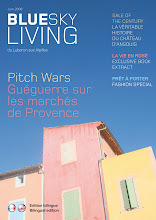 The new lifestyle magazine for the Luberon and Les Alpilles will be rolling off the press shortly. Meanwhile in the Luberon it has being raining. Usually the locals love tormenting the tourists with their attitude towards rain. They smile and explain that the region desperately needs rain content in the knowledge that the sun will come out soon. Only it hasn't. Thunder storm after thunder storm has rolled through the mountains and finally the smile has been wiped of people's faces, all the talk of how great the rain is has vanished. Instead everyone has been glum, except perhaps me - I have been too wired to be glum. On a cheerier note.....the paper back of La Vie en Rose is published this week in the UK. The book looks great and has apparently made it into great positions in all the bookshops. Copies of Blue Sky Living will probably reach people who are on the mailing list by mid-June...for anyone else who would like a copy it's not too late, just send me your address and I will put you on the list. Meanwhile if you are coming to Provence next week - like my brother - pack an umbrella. When I arrived in France my French was limited to the vocabulary I’d picked up at GCSE. And so to express surprise I confidently said: “Oh la la”, fully expecting the response to be as appreciative as the school examiners. Instead people started giggling. It appeared “Oh la la” was as comic and as dated as Hugh Grant saying “whoopsadaisies (sp? )” to Julia Roberts in Notting Hill. In response I jettisoned everything I’d learnt and concentrated on going “street“, punctuating every sentence with an array of “doncs,” and “quois”. People still laughed, but not quite as much. Then last week, on a hot sunny day (actually quite rare in Provence this summer), I was out with Elodie in the village. There she was kicking her little chubby baby legs in the air and attracting her usual crowd of admirers, when a young mother approached. Regular readers will remember that a few weeks ago, I wrote about us possibly buying a house. Well we’re going ahead…..eventually that is, when the French government lets us, because even though we are going to demolish the existing building (yes it’s that bad) and start again, according to law a termite investigation has to be conducted. I am not quite sure what happens if termites are discovered…..should I be worried - can termites survive a demolition, or will they just leave and eat someone else’s house. Answers please? Some of you may remember a blog I wrote about a month ago about a banker friend caught in the credit crunch and fearful for his job. His solution to his impending unemployment was to spend a year learning the poulet roti trade in France. After that he planned to return to London and conquer the city with his new chicken van. I’ve had to contact him twice since about his idea. The first time to inform him that a TV company had read my blog and was interested in shadowing his experiences and again this week to inform him that he had competition. Yes, apparently my mate is not as mad as I thought, because it turns out there is another person who has had exactly the same idea. What’s more Phoebe is a step ahead of my friend - who has yet to get the sack and is still prevaricating about whether his future lies in chickens. While he sits in his offices, his competition is plotting how to become the Walmart of the poulet roti business. She is to be seen sitting on a little stool in Lourmarin market, learning from the doyens of the roti world - Barbara and Christophe. She has a little notebook and takes down the spices they use on the skins of the bird. So involved is she in her project that when I visited all I could see were her ankles sticking out from the undercarriage of the van - it turns out she was drawing a diagram for a mechanic back in the UK so that he could customise her truck. Until now I thought that one only did stages/placements at big city firms, which tend to throw open their doors to budding students every year, but when I asked the legs dangling from underneath the van, exactly what she was doing, she declared in a very serious voice that she was on a month long stage. So when the poulet roti business explodes in the UK, remember you heard it here first. And also remember that there is nothing like the original and come and taste one of Barbara’s chickens. I had a girlfriend once who had the miraculous ability to be in two or even three places at once. She had long lustrous dark hair and almond eyes which held a glance for a quavering, quivering, indecent second too long. In the early stages of our relationship she kissed me goodnight at a teasingly early hour and but for her irresistible almond eyes we would have split up when I discovered that she was cramming two dates into the same evening. As the relationship progressed I became more and more heartbroken. Stories of her being seen with other men when as far as I could remember she’d been with me abounded. I began to realise that she would never be mine. She was a mythical creature, who seemed to be able to inhabit several universes, occasionally ours would intersect but while I was falling in love, her memory would record a totally different evening with a totally different man. I was Icarus flying to close to the sun. I mention this only because after meeting Eric Sapet the head chef of the La Petite Maison I was reminded of this girl. Thankfully it wasn’t final’s night at the Luberon drag queen contest, and even if it was the small chubby wonderfully “chefesque” Eric would never have held anyone’s glance for a quavering, quivering, indecent second too long. No, the occasion was a long weekday lunch in Cucuron and for some reason the more the meal progressed the more memories of my almond-eyed love flooded back to me. For a week or so after the meal I was disturbed and agitated. What had triggered the thoughts? Walking around Cucuron, I was continually bumping into Eric. There he was in his chef’s whites having a coffee in the Café D’Etang, moments later in the middle of a busy lunchtime service on a bank holiday weekend I noticed him high in the village near the ruin of the old fort, but when I scrambled back down the hill, he was shaking hands with diners in his restaurant. From the outside La Petite Maison is typical Provence - faded weather beaten crepy, with the painted “café restaurant” lettering only just visible. There’s a terrace with an iron trellis covered in leafy vines that invite long indulgent summer meals to take place in their shade. Dining inside La Petite Maison though, is like stepping into a different world. The upstairs room appears to hover in a nether region between a London club and the south of France. The walls are panelled with wood, the chairs are a curious hybrid between upright dining and recumbent smoking - copious with heavy arms which encourage you to relax into them. Water is served in silver goblets and the red wine decanted into a giant wine glass with a barely noticeable spout from which to pour the liquid into the mortal sized glasses also provided. On the €35 menu that weekday was an amuse bouche of steamed vegetables in an appetite-inducing vinaigrette, followed by a starter of fried frog’s legs, asparagus and garlic, an unlikely combination that inexplicably gelled. The main course, a cuisse de canard, served on a carrot and petit pois reduction was as exemplary as the first. The duck, was soft and meltingly meaty and the vegetable reduction cut through the fatty juices which often ruin duck dishes. Yet Eric somehow conjured this meal while simultaneously giving a cookery demonstration in the room below. Adding to the feeling that the restaurant somehow existed just out of kilter with normal rules were the staff. It’s notoriously difficult to get well trained experience staff in the rural areas of Provence. The rich and famous arrive every summer but they stay for two short months, and retaining workers outside this period is often difficult. Yet in May in Cucuron we were served by waiters who wouldn’t have been out of place in London or New York, possessing the vital ability to be unobtrusively efficient. Glasses were never left empty, plates never sat un-cleared and proper pauses divided the courses. The meal finished with a diplomat’s pudding made from Apt fruit confits, served with a nougat ice cream and a sauce Suzette. There was also a Catherine Wheel of multicoloured amuse bouche extras. Sated and content, but feeling slightly disturbed by the thoughts of my ex-girlfriend, I ordered a whisky. The waiter left the remains of the bottle, and the room emptied around-me, until I was left alone contemplating what an oak panelled dining room was doing in Provence. Next to my table was an old-fashioned drink’s trolley brimming with spirits. With the whisky bottle now empty I reached across and fingered the cognac. It wouldn’t hurt to help myself to a glass I reasoned. No sooner had the thought entered my head then Eric materialised through an arch to my right. Thanking me for dining at La Petite Maison he ushered me into the Provencal sunshine. It was only later that I questioned how he’d arrived at the table. The room he’d come from was a private dining room, with only one entrance, directly in my line of vision and the only plausible explanation for him appearing through that arch was that he’d been in the adjacent room throughout lunch. But then I’d seen him giving a cooking demonstration and somebody had had to cook my lunch. A week later as I sat outside La Petite Maison, with a glass of pastis, looking at the reflection of the plane trees in the etang my mind finally became calm. Some people, like my ex-girlfriend, exist outside the norms. However it wasn’t after all the curious ability of Eric to apparently be in two places at the same time that reminded me of her, it was the teasing, quavering, quivering ability of his food to hold the palate’s attention for an indecent second too long. In 1976 English wine merchant Steven Spurrier organised a blind tasting of the best French and American wines. To the lasting shock of the wine industry the American wines won and the tasting was christened the Judgement of Paris. In a light-hearted tribute to this event my new magazine Blue Sky Living hosted its own tasting. This time the wine was rosé and the competition for the French came from the booming English wine industry. Bruno, the director of Lourmarin cave co-operative was a worried man. It was 11.50am on a cold April day and all morning shoppers in the market had been gathering to taste two wines. Both were shrouded in tissue paper. One when poured had the colour of ripe cherries, the other vibrant pink coral. In front of Bruno was a sheet of paper filled with ticks where tasters had indicated which wine they preferred, and with just 40 minutes left - less if the dark clouds overhead closed in - the English wine from A Beckett’s vineyard near Wiltshire was a clear winner. Could the local Hav Couloubre - Cote du Luberon, pull back the margin and salvage French pride? Two hours earlier the Blue Sky Living team had arrived in the market. The closest trader - the oyster merchant, was vigorously quartering lemons and sewing them like seeds among rows of yawning shells. 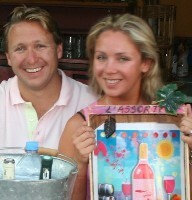 “Un degustation de vin rosé anglais,” cried out the Blue Sky Living team as the clocked chimed ten. “Ca existe?” he dropped the shell of the oyster in horror. Life was uncertain enough without the English starting to make rosé. “It’s down to global warming,” explained Bruno. A belt of chalk runs from Chablis, through Champagne under the Channel to England, and with higher temperatures and the same soil the English were beginning to make good wines. Chasing another oyster on its way with a glass of sharp Picpoul from Sete, the shopper showed no interest in tasting England‘s finest. “Soon they’ll have cicadas,” he muttered, as he shuffled away. Bruno shook his head and disconsolately marked one point for the English. The tasting continued with the English wine accumulating points quicker than the Cote du Luberon, even if it did so in a slightly unusual fashion. Without the benefit of a label and knowing nothing about the wine several tasters chose the English wine commenting erroneously that it was stronger and with a greater depth of flavour. As the morning continued more experienced drinkers easily distinguished the French wine: “c’est plus riche, plus sensual, plus capital.” “The English wine is drinkable - just!“ By midday the scores were nearly level and the first rain drops had begun to fall. and his wife Tanya quit their jobs and headed to France to try and make a living from pink wine. Jamie has written two books about their adventures, and you can currently catch Jamie and Tanya selling wine in their local markets.